Thanks to Starbucks, holding a cup printed with green mermaid logo has translated into style, coolness and status no matter where you are. For most of us who grew up drinking coffee off packets or getting kopi from kopitiam, standing in front of a never ending coffee menu board seems like a daunting scenario. We are in a huge dilemma where we think ristretto sounds exotic but we don’t want to spend big bucks getting something we don’t like. Sometimes we are shy to ask the barista and risk getting the ‘don’t you know’ look. 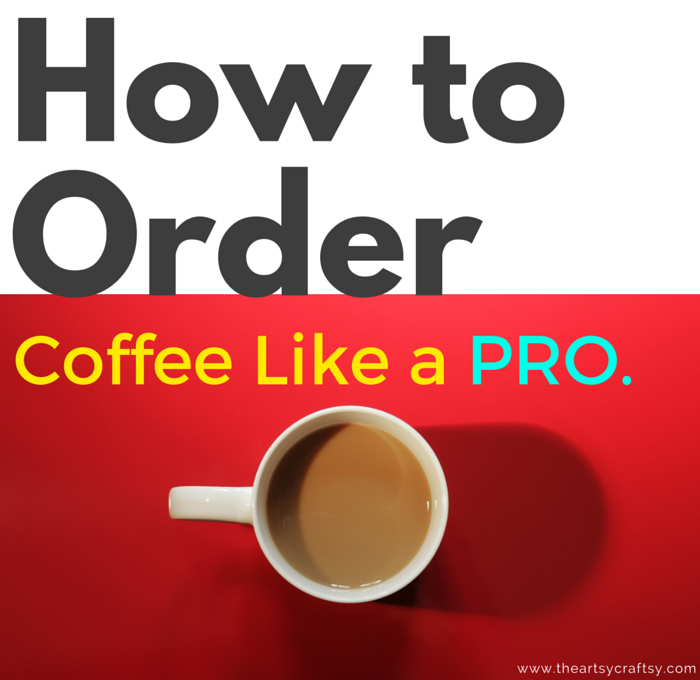 So, how to order coffee like a pro? Espresso is a type (or subset) of coffee brewed under super high pressure (9 bar) using an espresso machine which yield about 30 ml of extraction with 7–9g of coffee for a single shot. Basically, all coffees in our standard cafe start with an espresso base. Espresso – On its own, it is strong, flavourful, sharp and slightly acidic if extracted correctly. Espresso needs to be consumed quickly while its hot to enjoy the full flavour. Long black/Americano – Espresso with water. This is a diluted version of espresso with more volume, a good choice when you prefer milder black coffee. The difference between a long black and Americano lies in crema. To make a long black, espresso is extracted straight into hot water while retaining its crema. An Americano is made by adding hot water into espresso. Ristretto – Espresso with half the extraction hence half the volume. Think half sized espresso. It is sweeter than standard espresso without the bitter end. Coffee connoisseurs claim a ristretto reveals the skilfulness of barista who prepares it. They say given good beans, good roaster, good machine and good barista, coffee is best enjoyed black to experience the flavour of origin. So if you are ordering coffee to impress, take this into consideration. 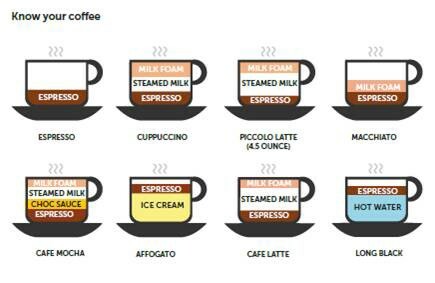 Caffe latte – Direct translation from Italian means coffee (espresso) with milk. This is the safest choice of milk coffee with moderate amount of foam — smooth and easy coffee. Cappucino – Espresso with milk plus extra thick foam. A traditional Italian cappuccino consist of equal part of espresso, milk and milk foam. This is for those who like foamy and creamy coffee. Flat white – Espresso with milk and very very little foam. Rumour has it that it originated from the down under (New Zealand or Aussie) just to satisfy demand of people who do not like milk foam in coffee. Piccolo latte –Basically a baby latte, where there is same amount of espresso but lesser milk compared to a standard latte. If you like stronger coffee but not as strong as espresso, this is awesome! Macchiato – Means ‘stained’ in Italian. It is an espresso with a dollop of milk foam that form the white stain, giving a slight sweetness to a strong espresso. Caramel Macchiato – Pure invention by Starbucks. More detail explaination on the myth of macchiato here. Caffe Con Panna – Espresso topped with whipped cream. Rich and luscious. Café Mocha – Espresso with milk and chocolate powder or chocolate sauce. When coffee meets chocolate, you get the best of both world. Feel free to explore addition of syrup flavouring, chocolate chips or candy in your coffee. You have the freedom to indulge and get creative with your coffee concoction. Go for extra espresso shot in your caffeine fix. Order any coffee that you like but go for decaf coffee beans. You can find more information about Swiss Water Decaf process here. 5. Depending on your mood and weather, decide if you want to get hot or cool down.